There is no description available for this video. 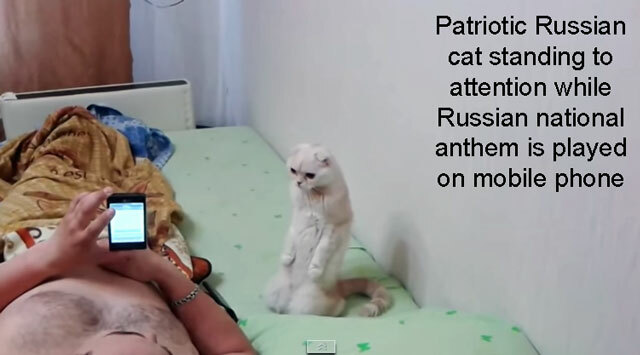 The cat, whose name is Margot (I believe), stands to attention when the Russian national anthem is played. Margot has either learned to do this through observing human behaviour such as the Russian military parades, perhaps on television, or she has been trained to do it by her owner. The more cynical amongst us might decide she has been trained. I favour learning by observation. Our domestic cats learn by observing us and what happens around us. This is quite natural because we know that cats learn how to hunt from their mother in the wild. We know that cats are good observational learners. There is well known video of a cat boxing while watching a boxing match. It appeared to be a stark example of the domestic cat learning human behavior from the television. The classic example of a mother teaching her kittens how to hunt is by bringing live prey back to the den when the kittens are about 4 weeks of age. The prey is released in the presence of the kittens whereupon the mother demonstrates hunting techniques on the prey. The kittens then practice these observed skills while their mother supervises them. Kittens are more readily socialised in human households if their mother is present and calm during the process. No doubt the kittens observe their mother and the fact that she is calm when handled by humans and follows suit. Most learning is from mother but adult males are involved too. More research needs to be done on social learning in kittens. This may prove to be a very important aspect of the life of domestic cats in the future because cats also learn from observing us who they treat as fellow cats. Perhaps cat owners should be more aware that their cat may be learning by watching them. This certainly applies in raising children but it may also be of some relevance in respect of the domestic cat as well. This entry was posted in keeping wild cat species, Video and tagged cat learning from observation, cat video by Michael Broad. Bookmark the permalink. In my opinion, some cats do a good job of mimicing their caretakers in some things. I have a couple that will try to mimic my “kissy” sound although they can’t do it well. Some will try to repeat other sounds that I make. Two will come with me and look for things in a pattern that I usually have. I sure would like to know who Damon observed that turned him into such a thief. Dee did you get the chance to see the video? I ask because it went blank! I have just replaced it with another. Sweet white cat with odd ears at attention. Margot has flattened ears so she might have some Scottish Fold in her. Very interesting sounds very true i guess. I know with some of the other cats, they get very clever. I like observing things sometimes. People think i got nothing to say, and are quiet. but are surprised when ill say something that they are not expecting. That book sounds interesting though. All animals including non-human animals learn a lot from observing. Very true, i notice jasmine does alot of observing of what we do. Especially when theres alot of different noises, like electric toothbrush and shaver. Shes definitely very interested on different things we are doing compared to the other cats. Cats are very clever, far cleverer than we give them credit for, they are in fact cleverer than humans! I wholeheartedly agree. Arrogant human doesn’t understand that sometimes. Interesting – and I assume the reason why Lilly knows to open doors by the handle. I think you must be right – I doubt she was trained. If anything she did it once and the man thought it was great and encouraged the behaviour from there on out. Sort of training as an after thought I guess. That would be my guess anyway. Does she jump up on the door handle to open it? I remember Tammy used to do that and knock things off the bench. Sounds right to me. Informal training if you like. It looks extraordinary. She immediately took up position when the music started so she must have practiced this. It looks trained-in to me. Michael although the Americans were the first to land on the Moon it seems the Russians are the first and only country in the World to have a “Cat Circus” known as the “MOSCOW CAT THEATRE”. Check this link :-http://www.kuklachev.ru/eng/about/ . Since i work from home have been able to observe,photograph and write about my cats from first hand accounts.The term “COPY CAT” describes the common cat as they are great mimics with the kittens copying their mother.Its real hilarious at times akin to human kids at play. Yes, I have a page on the Moscow Cat Theatre. Perhaps this cat was, at one time, a member of this theatre – could be.